Brickhouse Farms community is sold out and is not in active development by builder. If you are interested in Brickhouse Farms or similar new home communities, contact us today! Our agents are very familiar with new and newer construction in Chesapeake, and can identify resale opportunities in Brickhouse Farms, as well as builder inventory available in nearby or similar communities in Chesapeake. To view 6 more pictures, interactive maps and the full, detailed description of the Brickhouse Farms community, please Login. 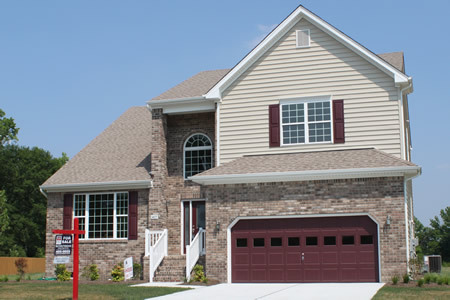 Brickhouse Farms brings land and newer construction homes together in Chesapeake, VA. Such real estate offers homebuyers all the benefits of living in the country with being so close to area cities. Military workers will find an easy commute to Norfolk Naval Shipyard, Naval Medical Center Portsmouth and Coast Guard Base Portsmouth. These homes offer value combined with quality. Lot sizes range from 10,000 to 67,000 square feet. More than half afford scenic creek views. Each single-family house at Brickhouse Farms gives buyers something to look forward to when coming home. This neighborhood is in the Western Branch section of Chesapeake, Virginia. This prime real estate location offers residents the ability to lead a double life; they can live in a land of rural charm then quickly commute to the urban jungle. Let the stress fall away upon driving back into Brickhouse Farms. Schools, medical facilities, shopping and theaters are all nearby these new construction homes. Golfers can retreat to the world-class course at Riverfront Golf Club. Designed by Tom Doak, these acres of putting playgrounds engulf the abundance of natural beauty. Observe the splendor of Lake Ballard and Hoffler Creek touring the paths at Hoffler Creek Wildlife Preserve. It could take years to explore all this surrounding land has to offer. Send me more information about communities similar to Brickhouse Farms. Our agents gladly offer FREE property tours of Brickhouse Farms, Chesapeake and homebuyer consultations to all serious buyers.